Let's face it, you deserve a TRIP! 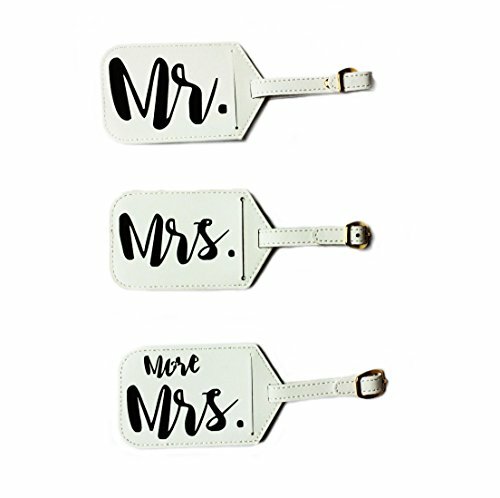 Whether you're freshly hitched (or you've been married and just need to get away), you'll be looking fresh off the runway rolling up with these luggage tags. These are perfect for every couple's style! They come in a set of 3: Mr., Mrs., and More Mrs. (because he'll only pack a backpack while you need AT LEAST 2 suitcases). These tags include an invisible backing where an information card is provided for you to write out your name, address, and phone number (to prepare for any worst case scenario). Everyone will love the beautiful gold colored belt loop enclosure. They make the perfect set so you can just fly by baggage claim (in style)! PERFECT WEDDING GIFT: Get your loved ones a wedding gift they'll actually use! These luggage tags suit EVERY couple. THANK US @ BAGGAGE CLAIM: No longer will you have to deal with the stress of not finding your suitcase, because these beautiful luggage tags will help find them from a mile away! You'll be the envy of everyone there! If you have any questions about this product by Dixie & Dot, contact us by completing and submitting the form below. If you are looking for a specif part number, please include it with your message.